Gentle readers! The fabulous people at Ford's have granted us a wonderful opportunity to be your FAVORITE BLOGGING TEAM EVER. Ford's production of "Sabrina Fair" by playwright Samuel A. Taylor and directed by Stephen Rayne is just revving up this week. The play is best known as the inspiration for the film Sabrina, starring Audrey Hepburn, Humphrey Bogart, and William Holden (and yeah yeah, there was a remake but lovely as its cast might be, it doesn't hold a candle to the original film). At Ford's, you'll see Two Hours Traffic favorite Tom Story as David, Susan Heyward (known to most of us from her days at the American Shakespeare Center) as Sabrina and Todd Gearhart as Linus. Readers, I SHIVER with anticipation. To win, all you have to do is leave a comment here answering the question that a number of us have been thinking about lately: What tops your list of best productions from the DC theatre scene? Go back into your memory of shows in the DC metro area as far back as you'd like, but really- what have you seen in DC that really, REALLY knocked your socks off and made you think, YES, this is what theatre is all about? I know I have a couple of shows that spring right to mind, but what are yours? Let us know and take a shot at winning free tickets to "Sabrina Fair"! Entries will be accepted until Friday at noon. Spread the word! Talk about DC theatre! See "Sabrina Fair"! Teller's MacBeth a couple years ago at the Folger just blew me away. MacBeth (I'm writing, not saying it) is set perfectly for mystery, magic and mayhem and Teller delivered, in devilish spades. "Is this a dagger I see before me?" Why yes it is, and our esrtwhile Thane is well into his monologue before the audience realizes the dagger is turning in slow motion, dripping the blood of his sins. Classic misdirection, magicians tricks and the grotesque blend to make this the most memorable show I've ever seen. The show that always pops to mind when asked this question is Longacrea Lea's "Man with Bags." The entire production blew me away. The cast's commitment to the strange and beautful world that they created was an amazing thing to watch and made we want to join them there. So far, the only theater I have gotten to see since moving to DC is The Twelfth Night. Which was awesome! I am looking forward to seeing many more things. Hmm, well, Tom Stoppard's Jumpers at Clark Street aaaaages ago was what really got me into him, so maybe I will go with saying that. I am so new to the DC area that I have yet to see anything here, but I can offer my favorite theater experience of a show that was in DC before I saw it. 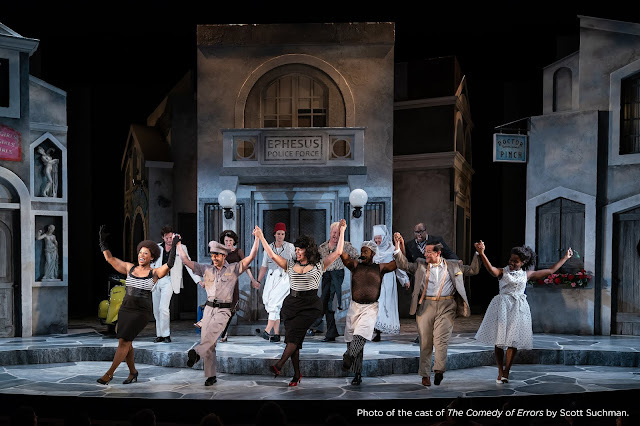 It would be Mary Zimmerman's Argonautika which was based at at the Shakespeare Theater Company before traveling to The McCarter Theater in New Jersey. I had free tickets and didn't know much about the production going in, but was expecting something a little staid. Suddenly the production exploded with this riotous combination of music, acting, sheer physicality and some of the coolest stage design I've seen in a while. I was so sad when it got to intermission because it meant it was almost half over. Constellation's Flea in Her Ear last year was riotously funny. It was a stellar example of the right way to do farce. And everyone from the director, to actors, to designers understood it. I haven't seen anything quite as funny since. The show that has always stuck with me is Nine Parts of Desire which I saw at Arena Stage several years ago. It was a one woman show and her transformations from one character to another were seemless and amazing.